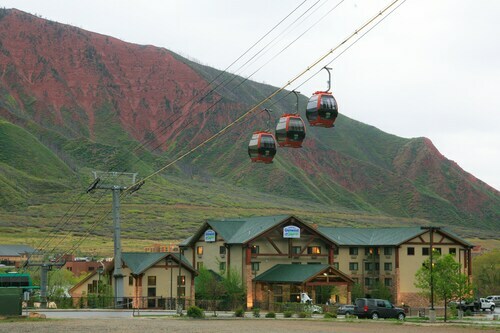 Situated in Glenwood Springs, this spa hotel is within a 15-minute walk of Glenwood Hot Springs and Glenwood Caverns Adventure Park. Iron Mountain Hot Springs is 0.9 mi (1.5 km) away. Glenwood Springs Station is 6 minutes by foot. 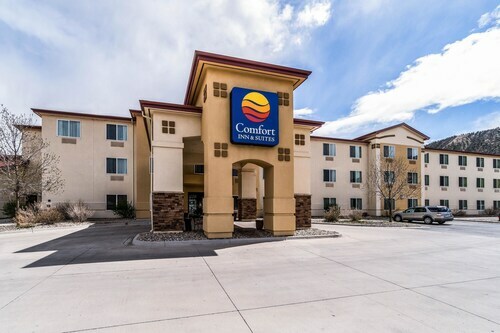 Situated in Glenwood Springs, this hotel is 1 mi (1.6 km) from Frontier Historical Museum and within 3 mi (5 km) of Glenwood Hot Springs and Glenwood Caverns Adventure Park. Iron Mountain Hot Springs is 2 mi (3.3 km) away. Glenwood Springs Station is 24 minutes by foot. 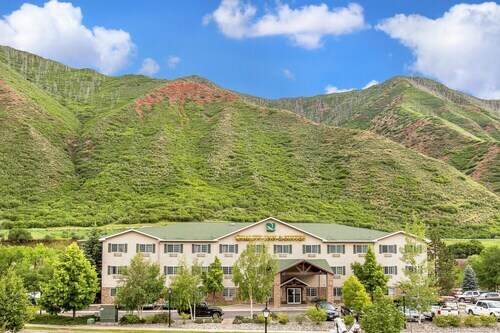 Located near the slopes, this Glenwood Springs hotel is in the mountains, within a 10-minute walk of Glenwood Caverns Adventure Park and Iron Mountain Hot Springs, and close to winter sports such as cross-country skiing and skiing lessons. Glenwood Hot Springs is 0.6 mi (0.9 km) away. Glenwood Springs Station is 17 minutes by foot. 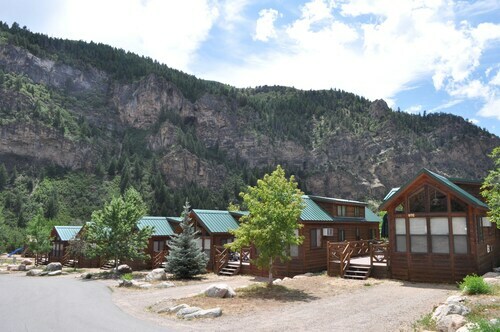 Located in the heart of Glenwood Springs, this motel is within a 10-minute walk of Glenwood Caverns Adventure Park and Glenwood Hot Springs. Iron Mountain Hot Springs is 0.6 mi (1 km) away. Glenwood Springs Station is 12 minutes by foot. 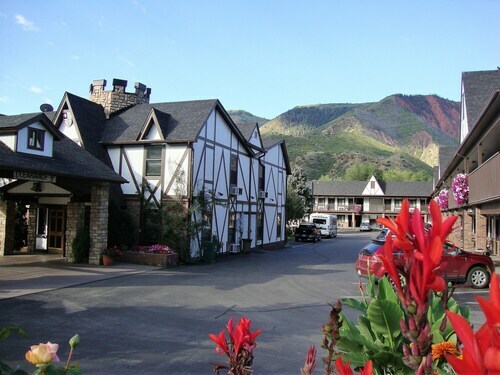 Located in the heart of Glenwood Springs, this motel is within a 10-minute walk of Glenwood Hot Springs and Glenwood Caverns Adventure Park. Iron Mountain Hot Springs is 0.7 mi (1.1 km) away. Glenwood Springs Station is 10 minutes by foot. 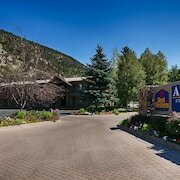 Situated in the mountains, this motel is within 1 mi (2 km) of Frontier Historical Museum and Glenwood Hot Springs. Glenwood Caverns Adventure Park and Iron Mountain Hot Springs are also within 2 mi (3 km). Glenwood Springs Station is 20 minutes by foot. 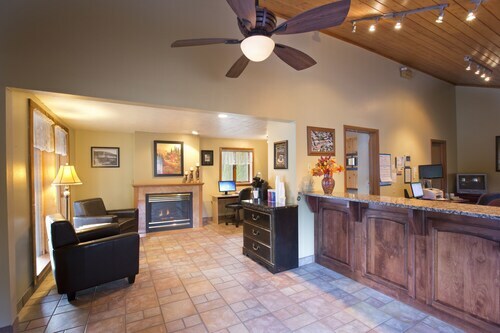 Situated in Parachute, this hotel is within 1 mi (2 km) of Parachute Community Park and Cottonwood Park. Battlement Mesa Golf Club is 1.4 mi (2.2 km) away. 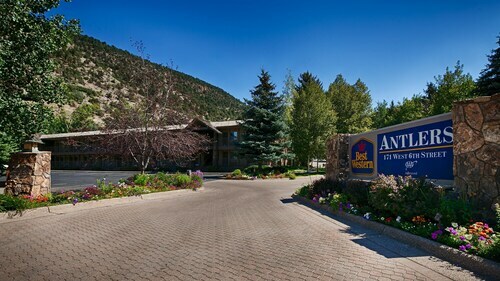 Situated in Glenwood Springs, this hotel is within a 10-minute walk of Glenwood Hot Springs and Glenwood Caverns Adventure Park. Iron Mountain Hot Springs is 0.7 mi (1.1 km) away. Glenwood Springs Station is 11 minutes by foot. 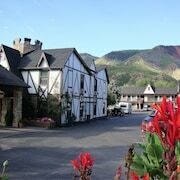 Situated in the mountains, this hotel is within 2 mi (3 km) of Johnson’s Park Miniature Golf, Glenwood Hot Springs, and Glenwood Caverns Adventure Park. Iron Mountain Hot Springs is 1.6 mi (2.6 km) away. How Much is a Hotel Room in Glenwood Springs? 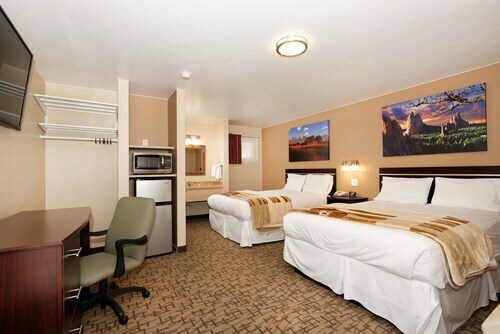 Hotels in Glenwood Springs start at $65 per night. Prices and availability subject to change. Additional terms may apply. 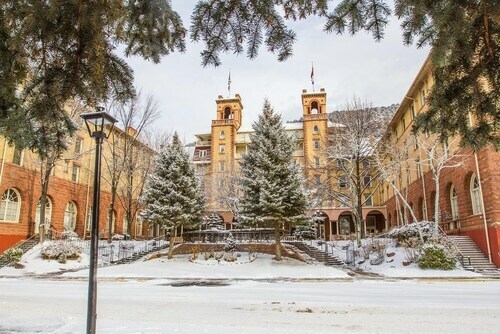 Glenwood Springs offers visitors an array of quality hotel and apartment possibilities. You will find 21 places to stay within 6 miles (10 kilometers) of Glenwood Springs's downtown on our comprehensive accommodation guide. 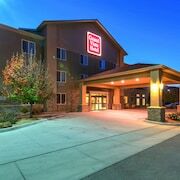 Some of the more central Travelocity-listed hotels of downtown Glenwood Springs are the The Hotel Denver and Hampton Inn Glenwood Springs. Head 40 miles (64 kilometers) out from Glenwood Springs and you'll find yourself in Parachute. 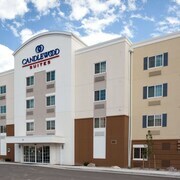 Here you are able to choose from lodgings such as the Comfort Inn And Suites and Days Inn & Suites Parachute. Alternatively, the is to be found 45 miles (72 kilometers) from the main drag of Glenwood Springs in the area of Rifle. Budget-concious travelers can breathe easy. 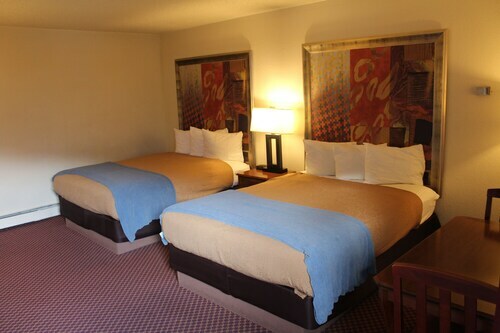 The Glenwood Springs area offers loads of low-cost hotels and accommodations. 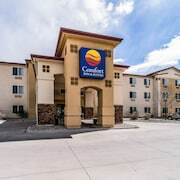 More options in the lower price range of Glenwood Springs hotels are the Candlewood Suites PARACHUTE and the Rodeway Inn Glenwood Springs. 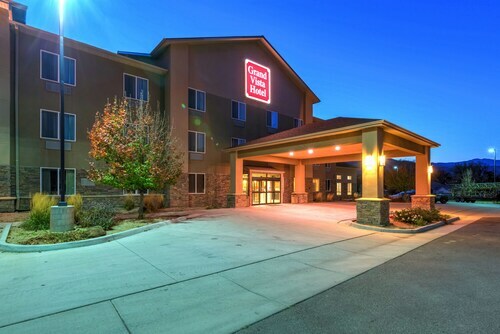 0.9 miles (1.4 kilometers) from the center of Glenwood Springs, you will find the Residence Inn by Marriott Glenwood Springs. 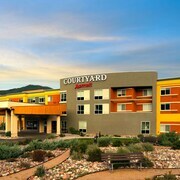 Alternatively, the Courtyard by Marriott Glenwood Springs is located about 0.8 miles (1.3 kilometers) away. 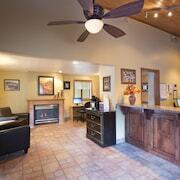 The Hotel Glenwood Springs and the Best Western Antlers are two alternative bases around Glenwood Springs. On your travels, why not experience more of the mountains and snowfields that are located in Western Slope? You can take time in some of the other areas of Western Slope. Enlightened travelers could admire the region's various sights or go snowboarding, skiing and cross-country skiing and then reserve a close Travelocity-listed hotel to stay at. 30 miles (47 kilometers) away from Glenwood Springs, you'll find Snowmass Village, which is home to Snowmass Ice Age Discovery Center and Anderson Ranch Arts Center. The Snowmass Mountain Condominium and Viceroy Snowmass are a few of the hotel and apartment choices in Snowmass Village. 50 miles (82 kilometers) to the southeast of Glenwood Springs, you can also stay at Crested Butte, which boasts the Buttes Condominiums and Paradise Condos - Crested Butte Mountain Rentals. The Crested Butte Mountain Resort and Trailhead Childrens Museum are other popular points of interest to check out when visiting Crested Butte. Now that you have explored accommodation options in Glenwood Springs, take a moment to read through Travelocity's Glenwood Springs area guide for the low-down on ways to spend your time around here. Our room was right in front of the ice maker and next to the gym. Not the quietest place to be. Great location within walking distance to hot springs, restraunts, and downtown. The cabins served their purpose and I would stay here again and recommend them to people with kids and dogs. Although the BBQ on the deck was filthy and the beds were average at best. But for somebody looking for a home base while visiting Glenwood Springs and wants to avoid paying Hotel prices this a good option. Great continental breakfast. Helpful and friendly staff.